What we believe about the Bible is foundational to every part of life. Scripture is the very Word of God, the final authority for all of theology, the governing source of all other doctrines. 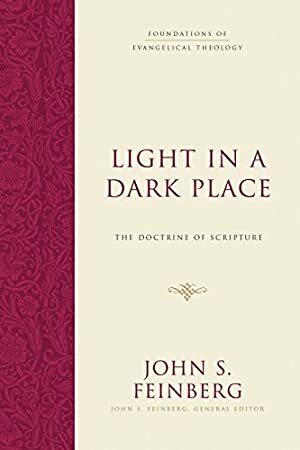 In the latest volume of the Foundations of Evangelical Theology series, theology professor John S. Feinberg has written a landmark work on the doctrine of Scripture, offering a robust, serious treatment of topics such as revelation, the canon, inerrancy, infallibility, sufficiency, preservation, and more -- all with the goal of helping readers cherish, obey, and be transformed by what God has spoken in his Word. Track It. This book has been $29.03 within the past year. We started tracking this book on February 22, 2018. This book was $40.38 when we started tracking it. The price of this book has changed 29 times in the past 424 days. The current price of this book is $31.68 last checked 55 minutes ago. This lowest price this book has been offered at in the past year is $29.03. The lowest price to date was $29.03 last reached on December 2, 2018. This book has been $29.03 one time since we started tracking it. The highest price to date was $50.00 last reached on June 28, 2018. This book has been $50.00 one time since we started tracking it. We last verified the price of this book about 55 minutes ago. At that time, the price was $31.68. This price is subject to change. The price displayed on the Amazon.com website at the time of purchase is the price you will pay for this book. Please confirm the price before making any purchases.